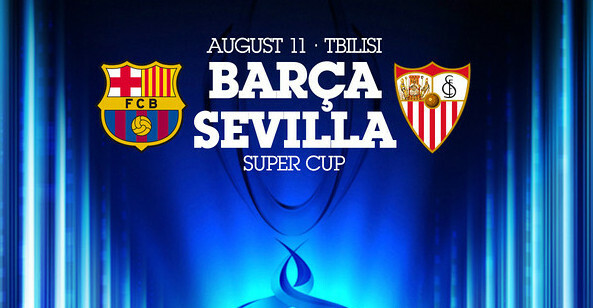 UEFA Super Cup 2015 Barcelona vs Sevilla Time, Telecast ChannelsThe UEFA Champions League winner Barcelona will take on Sevilla FC in the second straight all-Spanish UEFA Super Cup at the Boris Paichadze Dinamo Arena in Tbilisi on Tuesday, 11th August 2015. After the 15 editions of the fixture at AS Monaco FC, the venue for the annual meeting of the UEFA Champions League and UEFA Europa League winners now changes every year. Georgia are now set to hod their first UEFA football match after 2013 UEFA Futsal Cup finals. Check out here the full details of Barcelona vs Sevilla 2015 UEFA Super Cup match time & telecast channels. FC Barcelona and Sevilla once again about to play in the Europena Super Cup for the second time. In 2006, they are the respective winners of the Champions League and UEFA Cup (Europa League). Sevilla won that match with 3-0 against the Spanish giants. Since 2006, the two sides have met 25 times in which 16 games are won by Barcelona. while Sevilla managed to win four matches. So history is on Barca’s side and they are once again the favorites to win the title. This will be ninth appearance of Barca in this competition which is bigger than any other European club. They are the second most time champions of Super cup which means one more win will make then the most times champions, equalizing AC Milan who won it five times. For the second time in a row, Sevilla will play for the title glory. The red and whites were defeated at the hands of Real Madrid last year. The Andalusians saw off Barcelona 3-0 in 2006 but 12 months later succumbed 3-1 to Milan in an occasion overshadowed by the death Sevilla player Antonio Puerta three days earlier. Barcelona recorded their UEFA Super Cup appearances to nine and victory would allow them to equal AC Milan, the five time winners. Barcelona have won just time before that competition. Sevilla are appearing for the successive second season. In last year, they went down 2-0 to Real Madrid CF.